It seems we are finally getting warm weather and with that I've taken Butterick 4976 from long sleeves to short sleeves. I've made this dress several times - 3/13/11, 9/28/09, 9/12/09, 9/8/09 and I like to think of it has my go to dress. 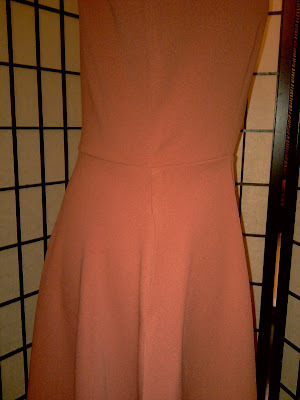 The fabric is a medium knit in a pinkish apricot. 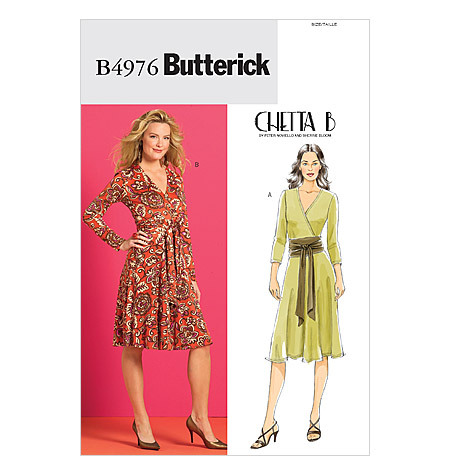 I used sleeves from Butterick 5313, instead of tracing off the sleeve pattern from B4976 and shortening them. I have yet to wrap my mind around tracing patterns. For this version I added pockets from Butterick 5210, using cotton fabric with a wood grain print. To ensure correct placement of the pockets, I took 5210 front dress pattern piece and placed atop the front piece of 4976 and marked accordingly. After sewing the pockets on and trying on the dress, with the pocket open... it looks like flesh is showing... ummm yeah. Thankfully the pocket openings did not gap during wear. 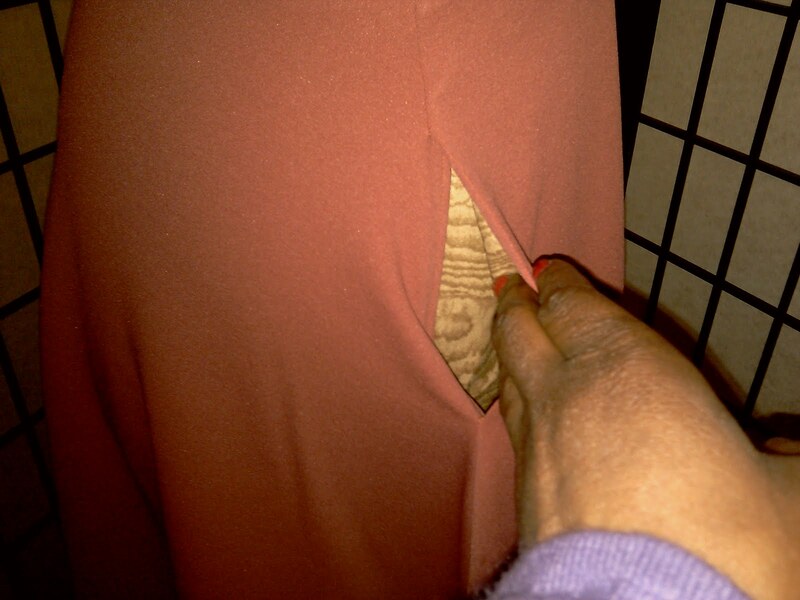 I removed an 1" from the hem line bringing it up to just above the knee. My plan was to wear the belt featured, but as usual by morning I settled for something different. Conclusion: fiddled with the neck opening a good part of the day, between pinning and unpining it.... total nuisance. To avoid this from happening again when I wear it, I plan on doing a running stitch on the underside of the right facing. I omitted using the clear elastic and that could be the cause of the fiddly neckline. Nice outfit. I may have to get this pattern also. Good job! Great Dress :) Love the color to..
Nice color on you! It's great to have a go-to pattern. Great dress. I like how you added the pocket and used your own belts. You look wonderful. That is so pretty! Love the shoes, too. Great dress! That style is classic, you could never go wrong! I wasn't that impressed when I saw it on the dress form, but it looks GREAT on you! It's funny how that can happen. Gorgeous dress and I love, love, love the pocket fabric! Beautiful. I made that dress once, need to make it again. Now that's a TNT pattern! This is another wonderful rendition. I love how you have styled this dress...looks fab! Pockets are always handy aren't they! Shame about the fiddling - we all know what that is like - great dress! The dress looks good. All belt option are great and complete a classic look. Very pretty! I have been collecting patterns lately for dresses with a wrap V-neckline, looking for the "right one." I may have to add this one to the list! I love that it has pockets too.